To create a convincing imitation of life, the fly tier has a few different elements to attend to. There’s color, of course, and profile, and sometimes sparkle or flash, but today we’re talking about movement. Before going any deeper into movement, a few qualifications. First, we are going to be talking about imbuing actual movement into flies, not merely suggesting the illusion of movement (which might take the form of a frozen splay of deer hair that speckles light to suggest fluttering wings). Now in this camp of actual movement we need to further distinguish between passive and active moment. Active movement is what happens upon direct manipulate by the rod or line—stripped streamers fall into this category. Our focus at the moment is on passive movement—the natural movement of materials that happen during a dead drift or swing due to the fly interacting with currents and micro-currents. 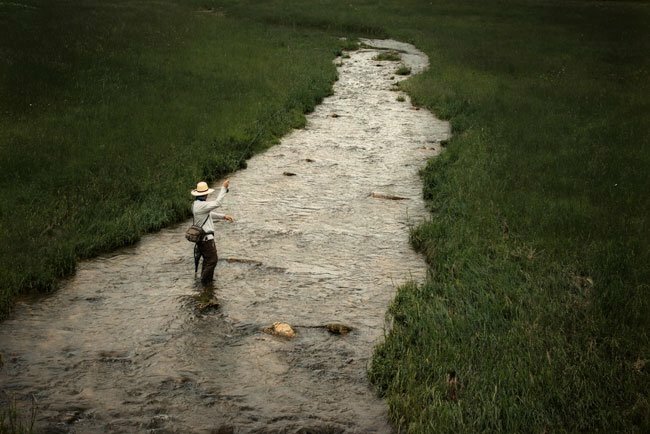 I found myself thinking along these lines after spending a week in Wisconsin’s Driftless, where I had the revelation that all my most effective dry flies and nymphs over the last decade or so had one thing in common: materials that actually moved. Scuds made of palmered philoplumes. CDC-bodied caddis. Pinched marabou San Juan worms (a la Gary LaFontaine). During windows of peak feeding activity I conducted a bit of informal empiricism, swapping back and forth between moving and non-moving representations of bugs and crustaceans. My informal data pointed clearly in one direction: flies with movement had something magical about them. If we’re talking about movement, we’re talking by and large about natural materials. They just move better than synthetics, especially at the short lengths demanded by nymph and dry fly patterns. This is why, even in steelhead flies like those of Greg Senyo, which employ a mix of natural and man-made materials, synthetics serve as a stage and spotlight for the movement of the naturals. The first place to look for adding movement to your dry flies and nymphs are your wet fly, pheasant and partridge capes. Pheasant and partridge capes in particular are fun to pick through—you’ve got feathers of many different colors, lengths, and textures. Pay attention not only to those feathers on the outside of the bird but also the ultra-soft, super life-like philoplumes, also called aftershaft feathers. These feathers are typically found behind and attached to larger feathers. They make great collars for caddis pupae and fantastic bodies for any patterns tied in the round—if you go the latter route, remember to reinforce your material with fine wire. Mayflies move quite a bit as emergers and spinners. The former squirms, the latter writhes. In addition to hackling with the above-mentioned feathers, consider emu when spinning up your imitations—they are long, palmerable, and generally have a few different lengths and texts per feather. Of course, using wet-fly hackle means you are totally outsourcing the responsibility of buoyancy to your wing, be it calf-tail, deer, elk, cdc, or what have you. But it’s a move well worth considering. The result will be a pattern that sits flush in the film and wiggles and waves—just like the real thing. Next up is one of my favorite materials: CDC. Europeans tiers do a lot of interesting work with CDC, and, wow, does it catch fish. Last summer my hot fly of the week on Poland’s Dunajec River was a Goddard CDC. State-side, one of my favorite dry flies is Hans Weilenman’s CDC and elk—take a look at this pattern and you’ll see it derives some inspiration from the mullet. Business up front, party in the back. This is, of course, just a starter’s list, an invitation to get you rooting through your materials and tweaking your favorite patterns. In my part of the country it’s time for the biggest baddest bugs of the year—yup, it’s just about hex-o-clock. While most properly silhouetted patterns will get eats early in the hatch, things get progressively more difficult as the hatch wears on. Try adding some extra life to your flies this season and see what kind of feedback you get—a little extra effort at the vise could make a big difference on a tough night.